William Sterling "Bill" Blair:870 PC COM MP (born 1954) is a Canadian politician, currently serving as the Member of Parliament representing the federal electoral district of Scarborough Southwest. He was appointed to Cabinet as Minister of Border Security and Organized Crime Reduction on July 18, 2018. Before federal politics, he served as the chief of the Toronto Police Service from 2005 until his April 25, 2015 retirement. Prior to his time as chief, Blair had a three-decade-long career in the service. Blair was born in Scarborough, Ontario. Blair's father had served as a police officer for 39 years. Blair considered pursuing a degree in law or finance, when he initially enrolled at the University of Toronto Scarborough in the mid 1970s. Blair initially studied economics at the University of Toronto. He left to follow his ambition of being a police officer, but returned later and completed a Bachelor of Arts in economics and criminology. Blair joined the Toronto Police Service while in university to make money and began taking courses on a part-time basis. Blair walked a beat near Regent Park and later worked as an undercover officer in Toronto's drug squad. After Blair earned his bachelor's degree in criminology, he advanced his career in the police service in the late 1980s, taking part in drug busts involving the seizure of millions of dollars of cocaine. Chief David Boothby assigned Blair to improve the poor community relations between the officers of 51 Division, which patrolled Blair's old beat near Regent Park. Blair normalized police relations with the community by measures such as sending cops to read to kids in local elementary schools and engaging with local businesses and churches. In 1999, Blair was considered as a candidate to replace outgoing chief Boothby, but mayor Mel Lastman, with the support of Premier Mike Harris, chose to hire Julian Fantino, then head of the York Regional Police. After reorganization of the senior ranks after Fantino's ascension as police chief, Blair became head of detective operations. Blair was selected in a 4–2 vote of the Toronto Police Services Board in early April 2005, and formally appointed Chief of the Toronto Police Service on April 26, 2005. He succeeded Mike Boyd, who had served as interim chief after the expiry of Julian Fantino's contract. Prior to his appointment as chief, Blair worked for approximately 30 years as a Toronto police officer, with assignments involving drug enforcement, organized crime and major criminal investigations. Blair served as president of the Canadian Association of Chiefs of Police. Responding to questions about a controversial regulation enacted by the Cabinet of Ontario to increase police powers during the summit, Blair was supportive, stating that "[i]t was passed in exactly the procedure as described in our legislation in Ontario". Post-summit reports revealed that on June 25, prior to the start of the summit and shortly after Blair defended a widely reported misinterpretation of the regulation in a press conference, the police department received a government bulletin clarifying the misinterpretation and explaining that the new regulation accorded them no additional power to demand identification outside of the summit perimeter. Blair's spokesperson stated that as of the press conference, Blair was unaware of the clarification; however, Blair did not retract his prior remarks to the press after receiving the bulletin. When interviewed after the summit, Blair confirmed that there was never an extraordinary legal requirement for the public to present identification within 5 m of the perimeter fence, but that he "was trying to keep the criminals out". In December 2010, following a critical report by the Ontario Ombudsman, André Marin, Blair admitted regret that he had initially interpreted the regulation at face value, and did not promptly clear up confusion about the meaning of the regulation. In 2013, Blair came into conflict with Toronto mayor Rob Ford after confirming to the media that the police had obtained a video of the mayor smoking what appeared to be crack cocaine. Blair said he was "disappointed" in the mayor. As the investigation into the mayor and his friend Alessandro Lisi continued, Mayor Ford dared Blair to arrest him and accused him of wasting money in their surveillance of Ford. Rob Ford's brother, Councillor Doug Ford, claimed that Blair had "gone rogue" and violated the Police Services Act when speaking out about the mayor during the ongoing police investigation. On August 11 2014, Blair served councillor Doug Ford with notice of defamation. Doug Ford accused the police chief of using the suit as "payback" in retaliation against the mayor for not extending his contract, but apologized for his comments shortly afterwards. In his last years in office, Blair was in conflict with several members of the Toronto Police Services Board over resistance to proposed reforms as well as his resistance to cut the police service's budget. On July 30, 2014, the Board announced that it would not renew Blair's contract for a third, five-year term. He retired from the police service when his contract ended on April 25, 2015 and was succeeded by Deputy Chief Mark Saunders. Blair declined to comment on his future plans while he was still police chief. The Liberal Party of Canada recruited Blair to be its candidate in Scarborough Southwest for the federal election held October 2015. A poll conducted by Forum Research suggested Blair would receive 39% of the vote against 29% for incumbent Dan Harris of the New Democratic Party and 27% for the Conservatives. On April 25, 2015, Blair confirmed his intention to seek the Liberal Party nomination in Scarborough Southwest. He won the Liberal nomination on June 13, 2015. On October 19, 2015, Blair was elected in the Scarborough Southwest riding. On December 2, 2015, Blair was named parliamentary secretary to the Minister of Justice. In January 2016, Blair was named as the head of the federal-provincial task force tasked with creating a plan for the legalization of cannabis in Canada. On September 19, 2017, Blair assumed additional parliamentary secretary responsibilities assisting the Minister of Health. On July 18, 2018, Blair was appointed Minister of Border Security and Organized Crime Reduction. In 2007, he was appointed an Officer of the Order of Merit of the Police Forces:840–841 and in 2012, he was elevated within the Order to the level of Commander. He is a Member of the Venerable Order of Saint John. :870 On January 19, 2013, Blair was honoured by the Canadian Tamil Congress, with their inaugural "Leaders for Change Award" for his exemplary leadership during the protests of 2009 in Toronto. ^ a b Carlson, Katherine Blaze (2013-11-09). "When 'the weight of the city' is on you". The Globe and Mail. p. M4. ^ a b c d "Command Officers' biographies • William Blair". Toronto Police Service. ^ a b c d e f g h i "Force for Change | Toronto Police Chief Bill Blair Interview, Crime in Toronto | By John Lorinc | Winter 2016 | University of Toronto Magazine". magazine.utoronto.ca. Retrieved 2016-01-12. ^ a b Wanagas, Don (2005-04-14), "Bill Blair's inside job", Now Magazine, 24 (33), archived from the original on 2012-10-22, retrieved 2010-12-24, Blair won in what sources indicate was a four-two vote. Word is, he managed to appeal to Fantino fans Case Ootes and Hugh Locke without completely alienating the so-called progressive contingent. ^ a b c "Tamil protesters leave Toronto highway". CTV News. 11 May 2009. Retrieved 29 July 2018. ^ "Police chief says Tamil protest moved 'peacefully'". CTV News. 30 April 2009. Retrieved 29 July 2018. ^ a b "Police tolerance of Tamil protests may lessen after highway storming: expert". CP24. Bell Media. The Canadian Press. 11 May 2009. Retrieved 29 July 2018. ^ a b c d Tamils Admin (24 January 2013). "Toronto Police chief Bill Blair honored at Canadian Tamil Congress dinner". on Tamils.com. Canadian Tamil Congress. Archived from the original on 16 February 2013. Retrieved 29 July 2018. ^ Tomasz Bugajski (June 29, 2010). "Peaceful protesters demand resignation of Toronto Police Chief Bill Blair". BlogTO. FreshDaily. ^ a b Poisson, Jayme (2010-12-08), "The buck stops here, Chief Blair says", Toronto Star, archived from the original on 2015-10-14, retrieved 2010-12-23, In the face of growing criticisms of his handling of the G20 and its aftermath, Toronto Police Chief Bill Blair says he will not resign. ^ Police powers expanded for G20, CBC News, 2010-06-25, archived from the original on 2012-02-17, retrieved 2010-12-24, Civil liberties groups are concerned about the new regulations, but Toronto police Chief Bill Blair defended the move to add the new powers and denied there was any attempt to deceive the public about how or when they were enacted. ^ a b Anna Mehler Paperny (June 29, 2010). "Toronto police knew they had no extra arrest powers". The Globe and Mail. ^ a b c "Police admit no five-metre rule existed on security fence law". The Globe and Mail. June 29, 2010. ^ "Police Chief Bill Blair on the Rob Ford video" (CBC News). October 31, 2013. Retrieved July 30, 2014. ^ "'Arrest me,' Toronto Mayor Rob Ford dares police chief" (Globe and Mail). February 28, 2014. Retrieved July 30, 2014. ^ "Highlights of the Chief Bill Blair era" (Toronto Star). July 30, 2014. Retrieved July 30, 2014. ^ Jennifer Pagliaro (August 12, 2014). "Toronto police Chief Bill Blair serves Doug Ford with notice of defamation". Toronto Star. ^ "Toronto police board won't renew Bill Blair's contract". Toronto Star. Retrieved July 30, 2014. ^ "Toronto gets new police chief". Toronto Star. April 20, 2015. Retrieved April 20, 2015. ^ "Campaign to recruit Bill Blair for Liberal party launched online". Toronto Star. April 15, 2015. Retrieved April 20, 2015. ^ "Bill Blair wants to run for Liberals in fall election". Toronto Star. April 25, 2015. Retrieved April 25, 2015. ^ "Former Toronto police chief Bill Blair wins Liberal nomination". Toronto Star. June 13, 2015. Retrieved June 14, 2015. ^ Rushowy, Kristin (2015-10-19). "Toronto's former top cop was elected for the Liberals in Scarborough Southwest". The Toronto Star. ISSN 0319-0781. Retrieved 2016-01-11. ^ "Trudeau names his 'middle bench,' as parliamentary secretaries assigned". www.cbc.ca. Retrieved 2016-01-11. ^ "Bill Blair faces 'formidable challenge' in leading marijuana task force". The Globe and Mail. Retrieved 2016-01-11. ^ Statement by the Prime Minister on changes to the Parliamentary Secretaries, Office of the Prime Minister of Canada, September 19, 2017. ^ "Appointment by Order of the Governor General of Canada, Chancellor and Commander of the Order of Merit of the Police Forces". Canada Gazette. January 5, 2012. 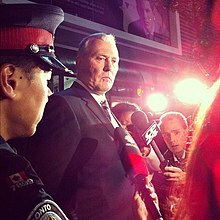 Wikimedia Commons has media related to Bill Blair (police chief).